It's a good sized house with substantial dining and drawing rooms on the ground floor, the principal attraction of these rooms being their 11 feet high ceilings and their marble fireplaces. On the first floor are a ladies' sitting room and three bed chambers while above on the upper storey are four more bed chambers. The basement includes the kitchen, butler's pantry, servants' hall, wine and beer cellars, dairy and larder. Outside is a small garden, a three stall stable and coach house with servants' sleeping quarters over. Also included is a pew in the chapel. It should be pointed out that this does not refer to the Wesleyan chapel, which was not built until 1814, but to the forerunner of St Mary's church. bearing the stencilled name, Captn. Linzee, Penzance. The wood was a piece of skirting board uncovered during renovations and appeared to be part of a recycled packing case. It's not totally conclusive but everything taken together suggests that Chapel House is the house which belonged to Admiral Linzee. The stencilled skirting board also tells us that Linzee acquired the house before he was promoted to Admiral in 1812. Linzee's career is sufficiently interesting to merit an article of its own but a few details here will help provide a backdrop to his time in Penzance. This is a period of sustained war with France and for naval officers it was a period of opportunity. Linzee was made Post Captain in 1794 and put in command of the 6th rate frigate Nemesis. He subsequently moved to the larger 36 gun frigate Oiseau and in the years 1797 to 1801 took several prizes. As captain Linzee was entitled to 25% of all prize money and he became quite wealthy; one of his prizes was was reported to have been carrying a cargo with an estimated value £10,000. He also captured the French frigate Dedaigneuse on 27 July 1801 off Cape Finisterre. An account of the action and capture was provided by Linzee in a letter to Earl St Vincent which was widely circulated in the press. Dedaigneuse was practically new and hence valuable but on his way home from the action Linzee mentions, almost as an aside, that Oiseau has also captured a Swedish vessel, Hoffnung, of 260 tons laden with brandy. No doubt also a valuable prize. 1802 saw the signing of the Treat of Amiens which provided a short-lived break in the fighting in Europe. Many of the vessels in the Royal Navy were paid off, their crews disbanded and their officers put on half-pay . Linzee's prize money no doubt insulated him from the worst effects of half- pay and it seems to have been at this time that he came to Penzance. His final command of the period, Zealous, a 74 gun ship of the line, was paid off in July 1802 after returning from Jamaica, and Linzee does not see service again until May 1805 when he takes over command of the Warrior from Captain Bligh who is about to leave for New South Wales to take up his posting as governor. The Morning Chronicle refers to Linzee as Captain Linzee of Penzance. The three years between July 1802 and May 1805 represent the most likely period in Linzee's career, up to 1812, when he is likely to have either built or purchased the house in Penzance. The only other opportunity comes during 1806 when, after a period of frantic activity including Finisterre and Trafalgar, Linzee was replaced as Captain of the Warrior by Captain Neave and and sent ashore on the score of ill-health. A year later, on 3rd January 1807, the Oxford Journal reported the death of the infant son of Captain Samuel Hood Linzee at Penzance, of an irruption in consequence of vaccination. By February 1807 Linzee is in command of the 74 gun Maida and is in Portsmouth and for the next four years is almost constantly at sea. For such an impressive building the origins of Chapel House are rather obscure. The building is somewhat grander but similar in style to other brick fronted buildings in Chapel Street, such as The Ganges and Crownley. Crownley became a bank (Batten, Carne and Oxnam) in 1797 and the building itself is dated at about 1780. There's also a frequently repeated story that Chapel House was at one time the Portuguese Consulate (some have it as embassy) but evidence for this has yet to be unearthed. One thing is for sure, Chapel House was not the home of Admiral Samuel Hood Linzee during the 1790s. Linzee did not become an Admiral until 1812 and only made Post in 1795. 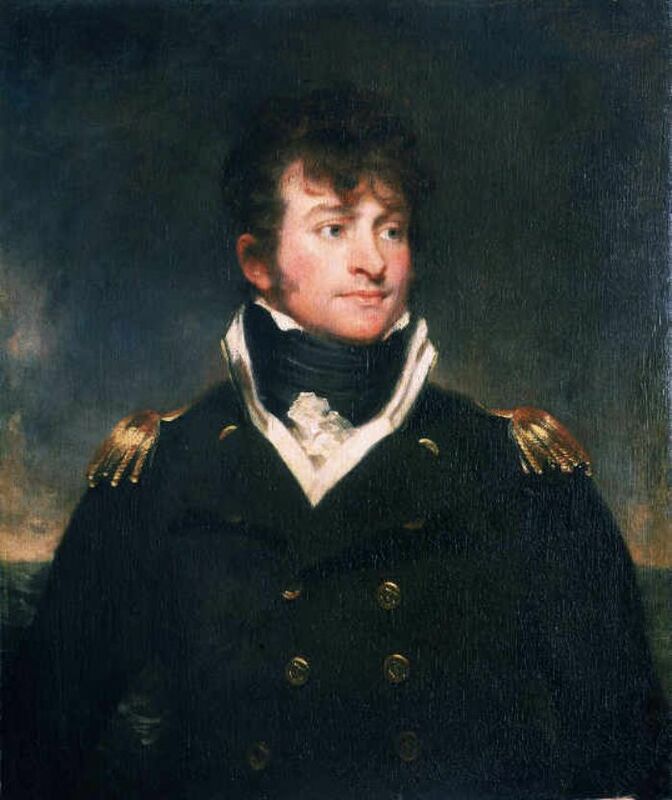 There was an Admiral Robert Linzee in the 1790s but he had no connection with Penzance. Whatever its origins, it seems likely that Linzee bought the house with his prize money sometime between 1802 and 1807 and had possession of it until he sold it in 1817. There are a number of sales of houses in Chapel Street in the period 1802 – 1807. On 27 December 1806 the house of deceased surgeon, James Warne, was advertised for sale and the description bears a resemblance to Chapel House though Chapel House seems a bit too grand for a provincial surgeon. How Chapel House came into the possession of Linzee remains, for now, a mystery. The house eventually passed into the ownership of the Carne family but that, like the career of Samuel Hood Linzee, is another story. The For Sale notice of Admiral Linzee's house appeared in the Royal Cornwall Gazette 11 October 1817. Linzee's sick leave in January 1806 was reported in the Morning Chronicle of 9 January 1806 and the death of his son was reported by the Oxford Journal 3 January 1807.